Whether checking out the college scene in Syracuse or the city setting of NYC, Dinosaur BBQ is always a popular food destination. In fact, half of Foodie Pleasure has been to the original in Syracuse and the other half has been to the old Harlem locale, so it was time to pay a visit to the (not so new anymore) space on 125th street together. We had to wait a bit for our party to arrive and then for a table, so by the time we were seated we both had dinosaur sized appetites. 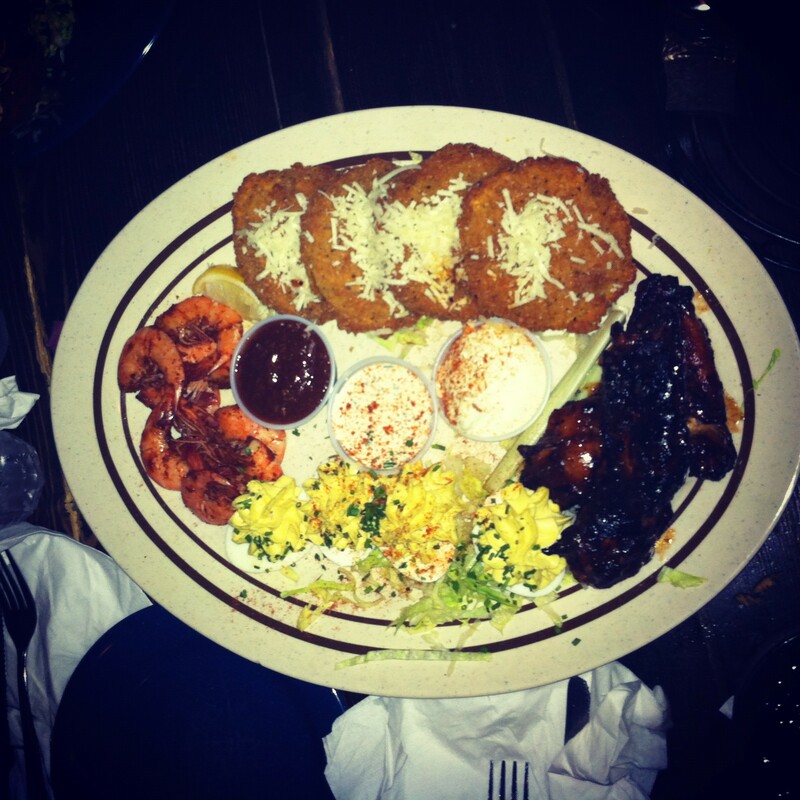 Not to fear- the menu at Dinosaur BBQ will cure any hunger pains! We started with the Swag Sampler Plate, which includes Spicy Shrimp Boil, Wings, Fried Green Tomatoes and Deviled Eggs, for the table. It was a great way to start the meal by sampling a variety of flavors. He says: The Deviled Eggs were awesome! I need to figure out how to make them on my own. The shrimp was good also with nice zest to them. She says: I can never get enough Fried Green Tomatoes! They’re one of those things that I always think about trying to make but never seem to get around to. The Deviled Eggs were also a treat. They taste like the summer potlucks of my youth! For our main course, we groaned at the name but went ahead and ordered the Sweetheart eal for Two, which includes a full rack, two cornmeal muffins and the choice of 4 sides. After a bit of a debate, we selected Cole Slaw, Creole Potato Salad, Simmered Greens and Roasted Whipped Sweet Potatoes. He says: It’s a MUST to order ribs at Dinosaur BBQ. They serve a good portion so make sure to have plenty of napkins handy! She says: I rarely order ribs, so when I do, it’s a treat. The ones at Dinosaur are meaty, saucy, and messy—just how ribs should be! The sides were all delicious, but the Creole Potato Salad really hit the spot. In the end, our eyes were bigger than our stomachs and we took half the rack and some of the potato salad home. It was just as good the next day and certainly made cooking easy! To balance the meat, we made broccoli and a side salad and enjoyed continuing the Dinosaur BBQ experience a bit longer. 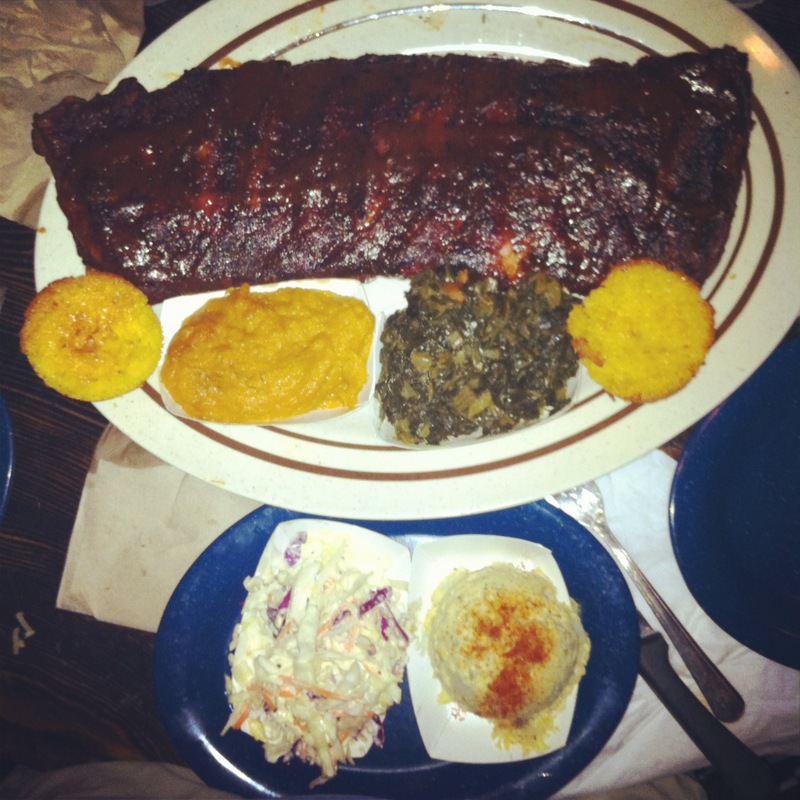 If you’re in the mood for some good BBQ and a fun atmosphere, check out a Dinosaur BBQ near you! Both the one in Syracuse and Harlem get pretty busy so arrive early to find parking and try to beat the crowd. We’ll definitely be back next time we’re in the mood for some hearty fare.